The PokerStars European Poker Tour San Remo €5,000 no-limit hold’em main event began today and the turnout was strong with 585 players in the field. 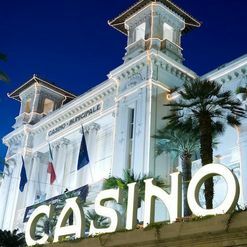 The total prize pool for the tournament will be determined tomorrow when another full day of poker will take place at the Casino San Remo on the shores of the Italian Riviera. There were 299 players that survived to day 2 and the chip leader is Russian player Alexey Rybin who holds 213,100, and close behind him is Italian Manuel Coppola with 212,000. They were the only two players to finish with more than 200,000. Notables that advanced with a strong stack include David Sands (130,000), Isabelle Mercier (106,500), Maxim Lykov (85,000), Anthony Lellouche (84,400), 2010 PokerStars Caribbean Adventure champion Harrison Gimbel (64,900), and Team PokerStars pros Luca Pagano (64,500) and Jude Ainsworth (62,000). Kranich won the hand when he hit a flush on the turn and he grew his stack to 42,000 with the win.